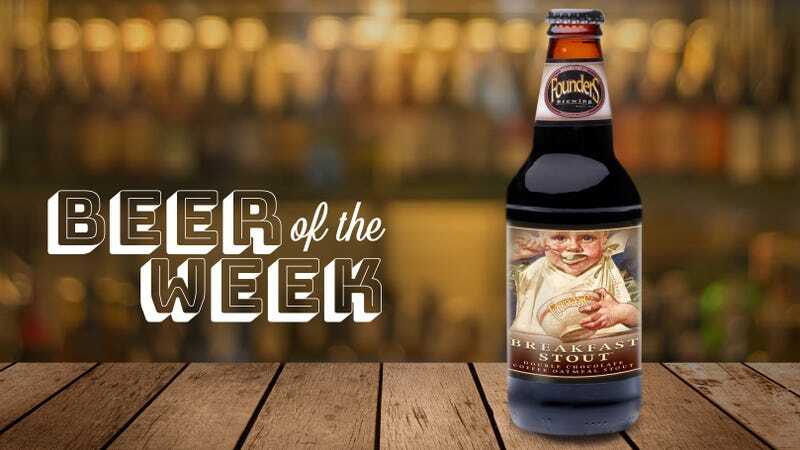 With all the (well deserved) freaking out over the return of CBS, you’d be forgiven for missing the other important Founders Brewing news: As of earlier this month, beloved Founders Breakfast Stout will be available year-round. The chocolate coffee oatmeal stout was previously one of the few beers that functioned as a seasonal sign post in my beer-drinking calendar: October had arrived, so now we had Breakfast Stout. And there was much rejoicing. But with the growth and expansion of Founders’ production and distribution come some perks—namely, more beer in more places more of the time. Breakfast Stout was prime for year-round production as one of the brewery’s most beloved offerings. I’ll stop short of calling it an everyday beer, since its Colombian and Sumatran coffee bean intensity and above-sessionable alcohol content make it a bit more special. But surely it’s worthy of being your weekly brunch beer—if you don’t have a weekly brunch beer, may I suggest that become your New Year’s resolution? Some of the highest praise I have for beers is to say they are well constructed, and Breakfast Stout certainly is. It’s beautiful to look at, smell, taste, maybe even contemplate. Its inky brown pour is crowned by an ultra-smooth head like milk chocolate frosting. That head seems to last forever thanks to the oats’ high protein content, which puffs up that foam and helps it stick around throughout the drinking duration. Despite the dense head, big oily espresso bean aromas easily reach the nose. Beneath that, toasted cacao nibs contribute more earthy roast, dominating quieter notes of graham cracker, neutral oatmeal, and mocha rum cake. Let the glass sit; dark cherry and plum brandy emerge once our noses acclimate to the coffee onslaught. Flavors deliver on the aroma’s promises: Americano coffee and cocoa powder benefit from a comforting boost of woody vanilla that builds through the sip. Darkly toasted pecan shell bubbles up at the center, sliding into an ashy cocoa finish that just hints at smoke. There’s a flash of bell pepper spiciness at the start of the sip (a result of coffee inclusion in some beers) that I didn’t care for, but it’s the lone criticism I could find for this beer. A velvety, medium-full mouthfeel paints the stout’s earthy, rich flavors across the tongue while an 8.3 percent ABV barely warms the throat. It’s the type of creation that reminds me it’s an amazing time to be a beer drinker. Friends and I would make the drive to Founders headquarters in Grand Rapids, Michigan in winter—a sometimes treacherous task—to taste Breakfast Stout and (RIP) Frangelic Mountain Brown from the source. Now, a glass of Breakfast Stout is only as far away as my fridge no matter the time of year.